Over the last few decades the athletic world has seem arms races across various disciplines as teams attempt to gain an edge on their competition. Understanding the complex linkages between the mind and the body is one of the biggest new frontiers for sports teams, and in The Performance Cortex Zach Schonbrun of the New York Times explores the territory and provides a surprisingly science-heavy account of the connection between neuroscience and sports. 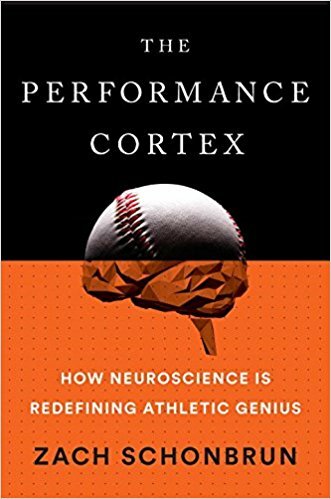 The Performance Cortex is effectively two books in one. It oscillates between chronicling the exploits of deCervo, a start-up founded by two Columbia neuroscientists designed to aid baseball players and explaining the science behind the motor system and examples of how athletes are leveraging neuroscience to improve performance. The Decervo sections were engaging and it was interesting to see how the product evolved and sold itself to teams. It also provided Schonbrun with the opportunity to share research around the remarkably complex action that is hitting a fastball. It takes approximately 400 milliseconds for a 95 mile-per-hour fastball to cross home plate from the pitcher's mound, and in that time a batter has to anticipate a pitch, identify it, decide whether to swing, and put bat to ball (should he decide that to be a sensible decision) all within that lilliputian time-frame. deCervo eventually evolved into a program that allowed baseball players to assess and improve their pitch recognition skills. The firm's founders discovered that there was considerable variation in players' abilities to quickly recognize pitches, and that recognition skills were a large driver of success. deCervo billed itself as a valuable talent-assessment tool for teams and after gaining traction with college teams the company met with over 25 MLB teams to tout their product. The notion that baseball players are better at identifying pitches and faster isn't groundbreaking. But what was useful is it gave managers an objective measure that appeared to explain variations in performance in teams.The use of a similar program called Neuroscouting encouraged the Red Sox to take a risk on an obscure outfielder from Tennessee named Mookie Betts in 2011, which seems to have worked out pretty ok for the franchise. The non-deCervo chapters explain the various ways the motor system impacts sports and the current scientific research on the topic. These are science-heavy and primarily rely on summarizing boatloads of research studies. Sometimes these can be interesting, such as the finding that increased touching through behaviors such as high-fiving and chest-bumping early in the season were correlated with team cohesion and future success later on in the campaign (though you would think that a better team would have more opportunities for such celebratory behavior than a bad one) and the theory that the prevalence of right handedness a result from mothers holding babies near their hearts because it helped them sleep. Shonbrun also does an excellent job distilling concepts into digestible prose for the lay reader, such as likening neurons sending signals to the spinal cord to tourists attempting to navigate Times Square. There is a lot for Schonbrun to cover (this is a far more popular research topic than the psychology of fandom I wrote about in my Superfans review) and readers will learn about the speed-accuracy trade-off, great localization debate and other major areas of motor skills research. Schonbrun will sometimes link research findings to their practical application and how players such as Neymar utilize them to their benefit, but sometimes Schonbrun will go in-depth into research around theories such as lateralization that were eventually debunked. This was one of the most science-oriented "psych/neuroscience applied to popular subject" books I read and Schonbrun really did his research and delved into the literature. This led to some dry sections, but it also meant that I learned way more than the average pop psych book. Schonbrun focuses solely on the motor system. There is nothing on genetics or concussions as those topics have already been covered in-depth in other books. I appreciated this decision as it made the book feel more focused and original. There are a few books touching upon somewhat similar subject matter, such as Brandon Sneed's Head in the Game, but none with at much scientific rigor. Sometimes this makes the book drag in parts, but overall The Performance Cortex is an illuminating book that greatly improved my understanding of and appreciation for the motor actions involved in sports.